Wu Lei celebrates after scoring in Espanyol's victory over Real Valladolid. 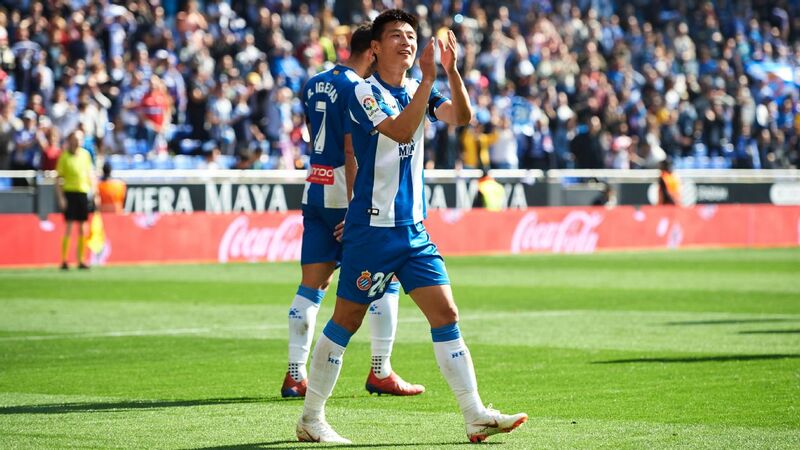 Espanyol forward Wu Lei became the first Chinese footballer to score in Spain's top-division La Liga, netting his side's final goal in a 3-1 win at home to Real Valladolid on Saturday. Wu, 27, sealed victory with a cool finish from inside the area in the 65th minute, giving the Barcelona club a second win in eight league games. The victory took Espanyol, who are by owned by Chinese company Rastar Group, up to 11th in the La Liga standings. Lionel Messi scored one penalty and missed another as Barcelona beat Real Valladolid 1-0 on Saturday to open up a seven-point lead at the top of La Liga. The Catalans played far below their vibrant best but were not troubled by the visitors at the Nou Camp as they ended a run of three consecutive draws in all competitions.